Do you ever maintain a workbook that contains a number of dynamic reports, each with a variety of settings? Consider holding all settings on a dedicated tab, changed via a VBA userform. Since all formulae will now be referring to another worksheet, an important consideration is to keep the name of that worksheet as short as possible (e.g. ‘AA’). Here you can click to download examples of a reporting workbook using local constants and one using global constants. 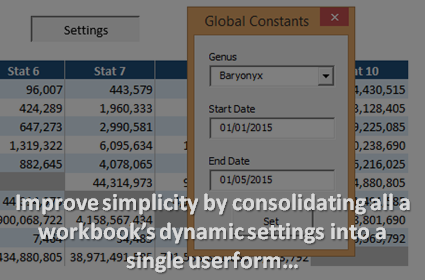 Macros must be enabled for the global constants workbook to function. This entry was posted in Excel.